This traditional, granite built terraced dwelling house, has five bedrooms and two public rooms or six bedrooms and one public room and other generous common space over three floors and a garden with shed to the rear. The property is double glazed, and centrally heated throughout, with radiators in each room on the ground and upper floors. It has a current HMO licence to provide accommodation for 5 tenants. Currently the accommodation is set out to be let to five professional tenants. On the ground floor it comprises a sitting room, two bedrooms, a spacious kitchen, a utility room, a shower room and a small dining room/study/quiet room. On the first floor, there are three double bedrooms and a bathroom with shower over the bath. There is also a substantial floored loft. There is a well maintained garden located to the rear and a large shed. Car parking is available free of charge on the street. The property is served by a good range of local shops and Woodside and the Berryden and Kittybrewster retail parks are within easy walking distance. Shops available within 100m include a Spar, Subway, Post Office, hairdresser, barber, and a pharmacy. Slightly further away there are carry-out restaurants (including pizza, chinese, fish and chips) and a frozen food shop. There is also a range of shops in the local Woodside area which is 5-10 minutes walk from the house. The Art Deco style Aberdeen Northern Hotel is nearby with full formal dining facilities and a public bar and lounge. The Woodside Medical Group has a surgery within a few hundred yards there are some community facilities in Hilton Community Centre and in the multi-service Woodside Fountain Centre. 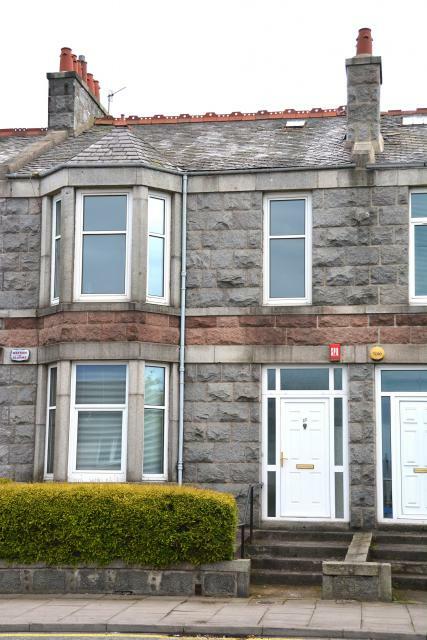 The property which is convenient for a number of buses is also within easy walking distance of King's College and Aberdeen Royal Infirmary (Foresterhill). The area offers easy access to the centre of the city and the airport, with regular bus services operating close by. Anderson Drive is a short distance away by car, giving access to the north and south of the city. When let to 5 individuals the shared accommodation will, at present, consist of a sitting room, a very spacious kitchen, utility room, a bathroom, and a shower room and a quiet room which can be used for study, reading or it can be used as a dining room. The kitchen has a six ring gas hob, two electric ovens, an extractor hood, a microwave oven, an American style fridge/freezer, a dishwasher, a washing machine, a tumble dryer, toasters, a coffee filter machine, slow cooker, George Foreman grill, electric can opener, electric mixer and electric whisk and various other electrical appliances. Crockery, cutlery, pots, pans, and most other kitchen essentials are available. The utility room has a sink, an iron, an ironing board and portable clothes airers. For individual lets some bedding such as a duvet, pillow, sheet, and duvet cover can be supplied at an extra cost. For the convenience of tenants, all utilities (gas, electricity, telephone, broadband, TV Licence) and other charges associated with maintenance of the property including a fortnightly professional clean of the common areas, gardening, and window cleaning will be managed by the landlord although the cleaning and gardening must only be considered supplementary to normal cleaning practices in a household. Link to details of total cost of tenancy. Smoking, bicycles and pets are not permitted within the property. Storage is available for bicycles and other larger sports equipment in the lockable garden shed. Although separate tenancy agreements will be required for each tenant this does not preclude a group of like minded individuals, friends or colleagues from individually taking up tenancies in the property at the same time. A deposit equal to one month's total cost of tenancy will be levied. Where it may be more sensible (eg in the case of a family) the whole property may be leased furnished as described elsewhere. In the case of a family it may be more appropriate for Council tax, utilities, and cleaning charges to be handled by the family rather than by the landlord. When the property is let to a family fully furnished to a family it can be set out with six bedrooms and one public room or alternatively with five bedrooms and two public rooms. Bedroom 1: 17'5" x 13'8" (5.31m x 4.17m). Well proportioned, bright, front facing double bedroom with a large bay window, decorative fireplace (not operational), laminate flooring, large radiator, and two alcoves each with a wall light fitting. Accessed from the main entrance hallway. Wardrobe, chest of drawers, small double bed (4ft), desk, easy chair, bookcase. Bedroom 2, Quiet Room, Study or Dining Room: 10'9" x 6'7". Small carpeted room with radiator facing the back garden. Bedroom 3: 10'6" x 8'10" (3.20m x 2.69m). This is a suitably sized, well proportioned, carpeted, rear facing, ground floor bedroom with radiator. It has a small double bed (4ft), a wardrobe, a chest of drawers, a desk and a chair. Bedroom 4: 12'5" x 8'11" (3.78m x 2.72m). This is a first floor, bright, well proportioned, carpeted, front facing bedroom with a small double bed, a small office desk and chair, a wardrobe, a chest of drawers and a bedside cabinet. Bedroom 5: 17'10" x 8'7" (5.84m x 4.24m). This is a very large, well proportioned, bright, first floor, front facing bedroom with a bay window. It has laminate flooring, a double bed, a large and modern birch wood style wardrobe. a desk, a chair, a bookcase and an armchair. Bedroom 6: 12'7" x 12'3" (3.84m x 3.73m). This is a rear facing, bright, spacious, carpeted, double bedroom, themed with antique oak furniture. This room has a large radiator, and very spacious wall cupboards in addition to a large wardrobe and a large chest of drawers. External:- The The back garden A gate from a rear lane or a door from the kitchen leads to the rear garden which is fully enclosed with a large shed, patio area, an area of grass, and a range of plants. A gallery of images is available on every page associated with a room. To use these galleries click on any picture in the gallery to view a user controlled slide show. To progress from one picture to the next hold the cursor over the large picture and click on the > arrow. Prior to contacting the agent for further information please make sure you understand the situation regarding payment of Council Tax. For information the linked request is made to all individuals interested in obtaining accommodation. It also provides some further details about Council Tax payment or links to details about Council Tax issues which may or may not be pertinent to your situation. The situation with respect to this property, however, is quite straightforward. This is a 'professionals only' property and so as a prospective tenant you will require to pay Council tax. Great emphasis is always placed on on the face-to-face meetings with prospective tenants and it is of great importance that prospective tenants view the property and meet with the landlords. In addition a vetting process is undertaken of prospective tenants. It is however important to note that all situations are different and that occasionally the process requires some flexibility, extra discussion and/or extra rigour. An indicative tenancy agreement has been supplied for interest and information. Click on any picture in the gallery to view a user controlled slide show of some images of the street from the front door and of the front of the house. To progress from one picture to the next hold the cursor over the large picture and click on the > arrow.